AtlasFAI is excited to announce that it recently welcomed a new center and doctor on board to serve patients in the Coeur d'Alene, Idaho area. COEUR D'ALENE, Idaho - June 8, 2018 - PRLog -- Let us introduce Dr. Orlando E. Nunez from our Coeur d'Alene, Idaho center! He is thrilled to be joining us as an AtlasFAI Affiliated Center. Dr. Orlando E. Nunez graduated from Rosalind Franklin University of Medical and Science College of Podiatric Medicine in Chicago, Illinois and completing a three-year Podiatric Medicine and Surgery Residency post graduation at Kendall Regional Medical Center in Miami, Florida. Dr. Nunez is licensed to practice as a Podiatrist in the states of Idaho and Florida, and licensed to practice as a Medical Doctor in the countries of Colombia, Mexico and Spain. Dr. Nunez is originally from Cartagena, Colombia where he attended the University of Cartagena and in 1989 obtained his MD (Medical Doctor) after completing an internship in General Medicine. He has worked as a general physician at St. Francisco de Asis Hospital in Quibdo, Colombia and Maria Auxiliadora Maternity Clinic in Cartagena, Colombia. He practiced as a PA at The Neuro Center in Chicago, Illinois. Dr. Nunez also worked as an Orthopedic resident at the Institute Mexicano del Seguro Social in Guadalajara, Mexico and completed a two year fellowship in Minimally Invasive Foot and Ankle Surgery sponsored by the Academy of Ambulatory Foot & Ankle Surgery. Dr. Nunez's mission is to provide the highest quality of care possible in a safe environment to the community and in the field of the surgical treatment of the foot and ankle. Towards this end he offers the most advanced corrective surgical procedures, traditional and minimally invasive, available. Dr. Nunez is trained in the HyProCure® procedure and specializes in the Isham minimally invasive techniques recognized by orthopedic and podiatric surgeons worldwide. 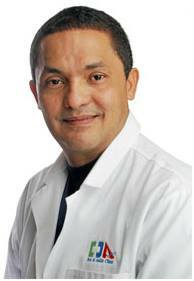 Dr. Nunez provides podiatric care for all ages and has a passion for treating all types of foot and ankle conditions. We're honored to have him join the AtlasFAI Family!